The Law Firm of Brian DeBauche, LLC is a small Denver law firm tailored to address your current legal matters. Brian DeBauche is a Colorado lawyer, working in areas of Colorado Law, like Colorado civil litigation or civil suits, personal injury, and commercial litigation. 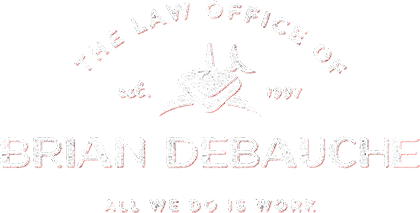 Brian DeBauche is a Colorado lawyer with nearly fifteen years experience in Colorado criminal defense, and Denver traffic and DUI defense, as well as representing clients in a variety of criminal cases across the state. The firm specializes in Colorado Criminal Defense, Colorado DUI defense, and Colorado Traffic Law, and litigates Colorado Traffic, Criminal, and DUI cases. This firm also handles civil suits for larger commercial clients, like Comcast of Colorado, and area businesses. Brian DeBauche is the lead lawyer in the firm, licensed since October 1997 and currently registered as an attorney before the Colorado Supreme Court, U.S. District Court, 10th U.S. Circuit Court of Appeals, and the Executive Office of Immigration Review. Current corporate clients of the firm include Comcast of Colorado, for civil recovery of utility damages due to excavation.